Bell Mountain; named for the shape of a bell. The mountain is comprised of ocean-bottom sediment capped by a hard hat of volcanic eruption material (not its own), that caused it to erode into this shape. 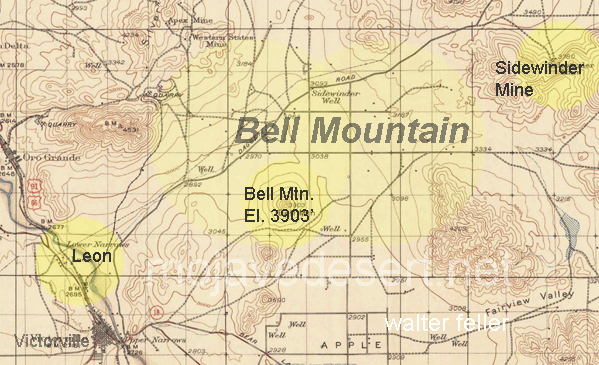 Bell Mountain (1): a hill, 3,903 feet high, Northeast of Victorville in Sidewinder Valley. Bell Mountain (2): a community and spare siding along the Mojave Northern railroad 8 miles northeast of Victorville that was homesteaded as early as 1912. The post office was established 1 June 1953 and discontinued 6 April 1956. 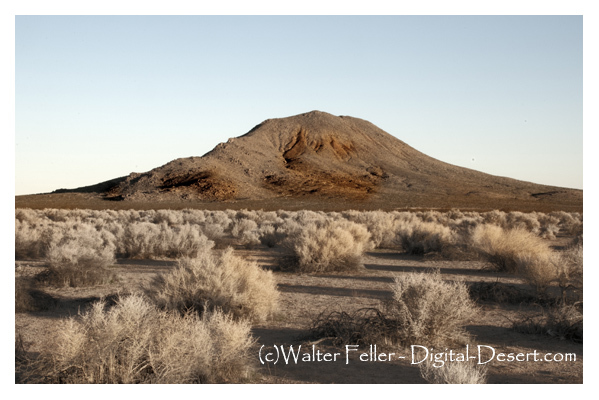 Bell Mountain Wash: a dry stream bed that flows 11 miles to the Mojave River nearly 2 miles north of Victorville. The wash passes just north of Bell Mountain (1). USGS MAP 1932 - 1956 ed. Postmaster: Creola B. Banks, 1 June 1953. Small community of about 150 residents 10 NE of Victorville. It took its name from a nearby bell-shaped hill 3903' elevation. The Mojave Northern Rwy. ran from Leon, a siding at the Southwestern Portland Cement Co. and passed through Bell Mountain to the company reserve quarry near the Sidewinder Mine. That rwy. was originally certified as a public carrier but in 1925 changed to a "plant facility." When the 4th class P.O. was established in 1953 most of the patrons were miners and residents living on nearby farms. An early settler was Mrs. Eleanor Washington who homesteaded in the area in 1912. The P.O. was located in a general store and was closed for lack of business.